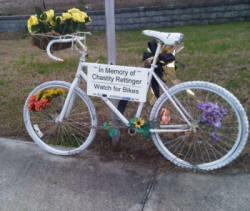 Ghost Bike License Plates / Oversized Plates for Ghost Bikes, or Signage. Although we've been creating Ghost Bike Plates privately, we've been asked to open them up to the general public for individual purchase. Ghost Bike Organizations, please e-mail us for a discount code for multiple purchases. Ghost Bike Plates are metal 9x18 plates with 4 slot holes for application to bike's, poles or can be used as sineage for bike shops, car dealers, and automotive mechanics. 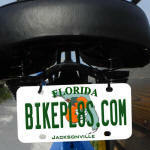 Personalized Ghost Bike Plates can be printed in full color with text, photo or logo. There are no set up or color charges. Choose your colors, text and text style/Font. Submit your photo, logo or your own high resolution design graphic.If you are designing a graphic yourself, please make sure the graphic is at least 300dpi. You may also submit a high resolution crisp clear .jpg file. Please take holes into consideration when designing. A Digital Proof will be sent for all 9x18 plates for approval, please be sure you clear us in any spam/bulk mail filters. Order Below, Let us know how you want it set up. (2 top 2 bottom) for application- printed full color. to be printed on plate. if none please put n/a. Please give us any design requests, image placement or additional instruction here. Remember... we will send a digital proof for approval. Our Bike Plates are made from either solid polymer fiberglass - plastic, and are approximately 3/16 thick, or aluminum,. We offer a variety of sizes , 2.5x4, 3x6, 4x7 and 6x12. (only 3x6 and 6x12 are offered in plastic - all sizes are offered in aluminum). Plates may have 2 top round holes or 4 slot holes (2 on top and 2 on bottom) for application. The 2 hole 3x6 and 4x7 plates have a UV coating which may cause the plate to appear blotchy when viewed from up close - they look fine from a distance. The 4 hole plates are high gloss. All Plates are Printed in full color. with no set up charges!